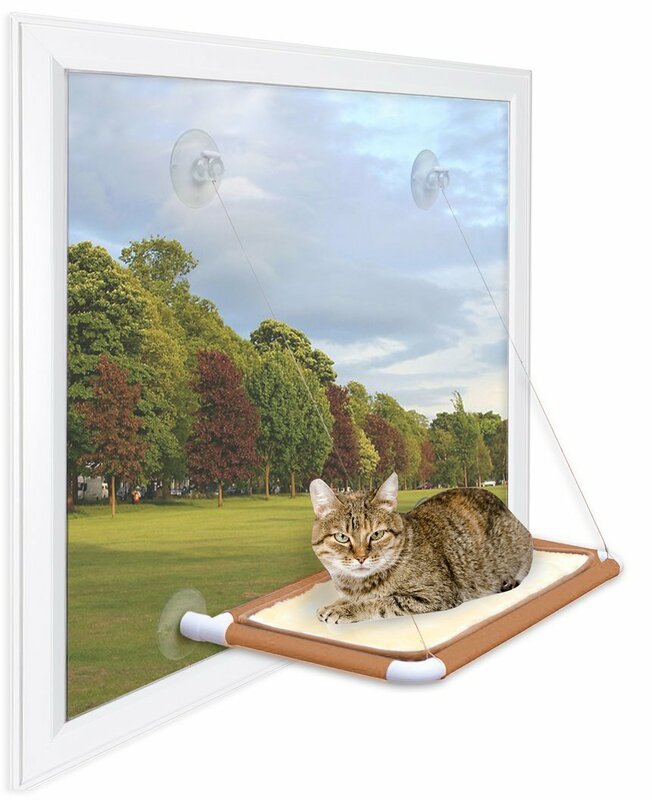 Most cats love to bask in the sunshine so I was sure that getting this Pets and More Cat Window Perch with Huge Suction Cups would make for a very happy kitty. Many of the previous reviews complained about the difficulty they had in putting their cat window perch together, so I am very happy to say that mine came assembled with the exception of having to put on the suction cups. This was easy enough to do though, and just took a minute to finish assembly. Another complaint from others was that the suction cups didn't hold. I don't know if they are different between different colors, but I got the brown one and read another review where they had two and the brown one stayed on the window very well but the grey one did not. My brown one stayed suctioned to the window very well, and held the cats with no problems. Just be certain to clean the window thoroughly, and if you still have trouble, clean it again with rubbing alcohol and you shouldn't have any issues. Even though I have never seen a cat (aside from lions and tigers and such) that weighs anywhere near 70 pounds, I really wasn't impressed that the title of this product it says it can hold 70 pounds but then in the description it says it can hold 50 pounds. In either case, I don't own one of those giant cats so this really wan't a concern, but I could not picture it holding my 65 pound dog. I like that it provides a comfortable place for the kitties to relax in the sunlight, and the removable bed is perfect. It is also nice that it is easily moved from one window to another if needed. So far I haven't had any issues with it falling from the window, but if I start having issues with this I will be sure to come back and update as necessary.